Back on the regional stage only 18 months after Samoa’s U-17 debut in the Cook Islands last year, Shalom Fiso is wearing the captain’s armband again and proving her ability to lead and score at any level. The 18-year-old has been guiding Samoa through their challenging campaign at the OFC U-19 Women’s Championship in Auckland, New Zealand, and although their opponents have provided some difficult assignments, Fiso has been enjoying every minute. “This is a huge opportunity for me,” she said. “I’m representing our country and I know that there are heaps of girls back home in Samoa that really wanted this opportunity. Although Fiso threw everything into the trials for the U-19 women’s team, the humble striker was still surprised when she heard her name being called, and being selected as captain was an unexpected bonus. “There were lots of girls competing for a spot in the team. They wanted this opportunity too. I trained hard for it, I wanted to go for it and get this opportunity,” she said. 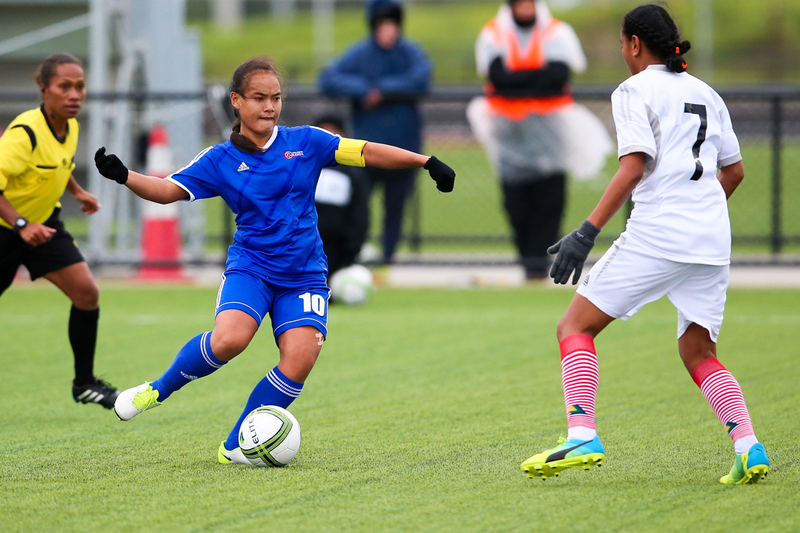 After leading Samoa in their debut at the OFC U-17 Women’s Championship in the Cook Islands last year, Fiso is feeling wiser and more confident wearing the armband this second time around. Although the Cook Islands had its challenges, the U-19 competition has been a whole new level for Fiso, but she is happy to see her side’s improvement on the field. “When we were in the Cook Islands it was a pretty hard but this competition, it’s a really hard one too,” she said. One of the most challenging but rewarding parts of the competition for Fiso has been setting an example for the younger, less experienced players. “It makes me proud to be a role model, and I know my family are proud too,” she said. “It pushes me to go for it and play hard because I know they look at me and how I play on the field and my actions on and off the field. With the competition wrapping up on Monday, Fiso will soon make her return to Samoa, but she has no plan on hanging up her football boots any time soon. “When I get home I’ll be back playing again. I will share all my new skills and techniques and take these to my club and the girls back home, especially my little sisters,” she said. The next step in Fiso’s football career will come this Friday when Samoa face defending champions New Zealand. After meeting them in the U-17 competition last year, Fiso is feeling confident about countering their style of play. Samoa will play New Zealand on Match Day 4 of the OFC U-19 Women’s Championship 2017 at Ngahue Reserve in Auckland on Friday 21 July at 10am (local time).